Learn trades, artisan crafts and 21st century skills with Technocopia. All full week summer programs include experimentation in biology in chemistry, walks to the park, local live music, yoga and opportunities to meet with local artists. Different trades and arts are offered every week which allows students to participate in more than one week and learn something new every time! Students are kept in a strict 6:1 (student to teacher) ratio. Our experienced staff make all listed projects and more adaptable to many different ages and skill sets.All materials are included with the costs listed below. All days run 9am-4pm. Laser cut castle and 3D printed busts. Laser cut projects, 3D printing and wood working! Work in our digital fabrication studio and with fabrication tools, Full Spectrum laser cutter and the Lulzbot Taz 3D printer. Learn the magic of making physical objects from 2D and 3D computer generated designs. In the same week meet with experienced wood workers to learn how to make boxes and frames with simple hand tools. For students aged 13+ working in our glass flame working studio is also an option this week. Please email us for details. Students work with screens and shirts in the design studio. Sign up just for Screen Printing & T-Shirt Design! Spend the week in our design studio, electronics bay, and textiles shop. Learn common ways that t-shirts are printed and learn how to transfer a digital file so that it can be transferred to a screen for printing. Proper print making will be taught and screens will be yours to keep for later printing on anything more you like! In addition this week, learn the new trend of wearable electronics in clothing! Spend time in our electronics bay learning basic electronics and circuit design with a goal of making clothing with electronics embedded within them! An introduction to techniques in sewing and up-cycling clothes will be included. For students aged 13+ working in our glass flame working studio is also an option this week. Please email us for details. Students hold their illuminated sculptures. Spring 2016. This week will focus on a variety of techniques in 2D and 3D computer aided design with a goal of creating t-shirts and an illuminated sculpture! Students will learn how to create 2D vector images using free Inkscape software, and how to cut on the vinyl cutter, and cut and engrave on acrylic with Technocopia's Full Spectrum laser cutter. A few basics in electronics, and students will illuminate their acrylic sculpture with an LED strip and controller. Students will also learn and use 3D CAD (computer aided design) to design and 3D print a base to hold the sculptures. 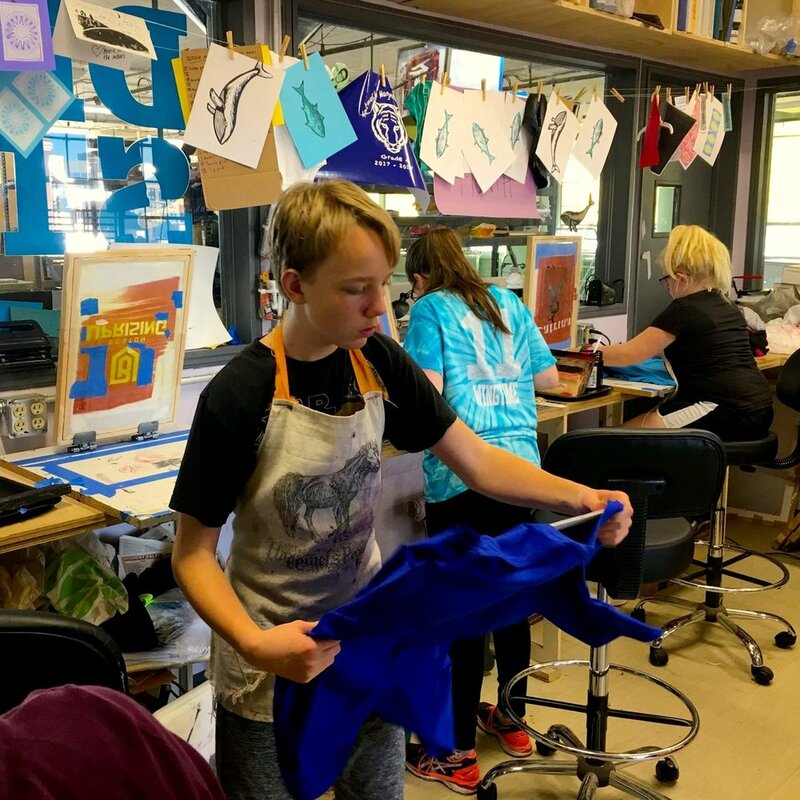 Also this week, learn common ways that t-shirts are printed and how to transfer a digital file so that it can be transferred to a screen for printing. Proper print making will be taught and screens will be yours to keep for later printing on anything more you like! This week will teach techniques in drawing for digital design, and 2D and 3D computer aided design with a goal of making an illuminated sculpture. It will also include several art based chemistry projects. Local artists will teach drawing methods that primarily use contour lines and negative and positive space to make good digital graphics. This with computer aided design using Inkscape (2D design) and students will learn how to create 2D vector images and how to cut on the vinyl cutter, and cut and engrave on acrylic with Technocopia's Full Spectrum laser cutter. In addition 3D CAD (computer aided design) will be included to incorporate designing and printing a base for the illuminated sculpture. A few basics in electronics, and students will illuminate their acrylic sculpture with an LED strip and controller. Art chemistry projects will include work with thermochromatic and UV activated pigments, making paint from scratch, and art that lights up through chemical reactions and phosphorescence. Full cost $375 New savings! Launched in 2017 by fashion-tech startup ThunderLily, Fashion Tech for Girls™ is a new program for girls to ignite their love of math, science, engineering & technology by learning fashion design. The truth is fashion tech is in a really exciting place, from exploring the geometry of design or the chemistry of dying fabrics to clothes that can be programmed with Arduinos or 3d printed – fashion design can be a wondrous world of exploring and creating. We teach girls the actual techniques that they need to be fashion designers and then inspire them to use their creativity to solve real world dilemmas. This program is designed for students aged 9-12 and who identify themselves as female. Cost for the full week of Fashion Tech is $375, and a deposit to hold a seat is $100. Register before July 1st and receive $50 off the total. Scholarships for all or half off the tution price are available! Application requirements include a short essay of interest (submitted by the participating student) and submission of the student's family househod income. Application deadline is July 1st. Please apply HERE. Please contact lauren.monroe@technocopia.org with questions.